Vertigo is a specific form of dizziness that involves the sensation of movement. It is most commonly described by patients as a feeling that the room is spinning. The causes of vertigo break down into two categories—central and peripheral vertigo. Peripheral vertigo refers to physical causes of vertigo such as an ear infection. Central vertigo refers to underlying causes that are related to the central nervous system such as a tumor in the cerebellum. 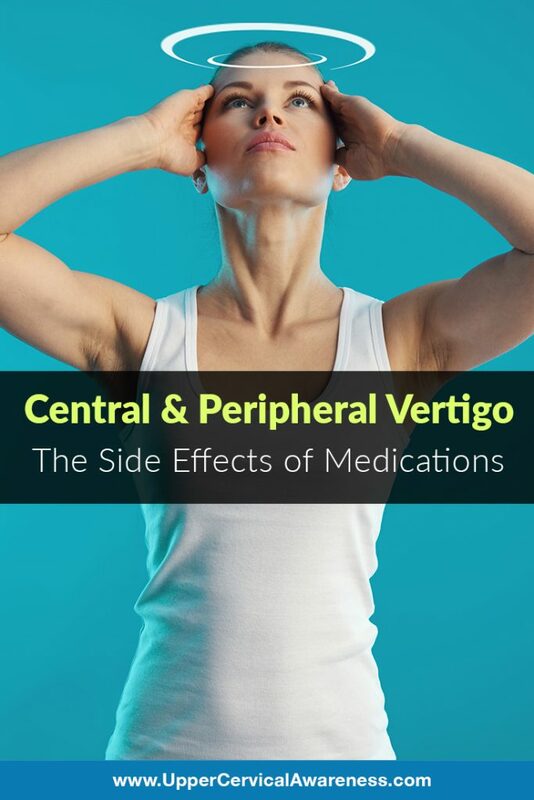 However, there is one common factor that connects central and peripheral vertigo—either can be the result of drug use, whether prescription drugs or illegal drugs. Vertigo is a common side effect of many medications. This is especially true of drugs that affect the central nervous system. For example, many medications used in the treatment of depression, seizures, pain (opioids), and anxiety are known to cause vertigo. Since these medications affect the central nervous system, it is considered central vertigo when these medications are a factor. However, there are also a number of medications that affect the inner ear and may cause peripheral vertigo. Obviously, you should speak with your physician before stopping medication use, even if you are experiencing some side effects. However, there is another common cause of vertigo that is not medication related. This is a misalignment of the upper cervical spine. The C1 and C2 vertebrae are specially designed to make it easy for the head to move. Unfortunately, this same mobility increases the likelihood of misalignment. This is especially true if someone suffers a head injury while playing sports, is involved in a car accident, or suffers another type of trauma to the head or neck. If you are experiencing vertigo, particularly if you have a history of head or neck trauma, such a misalignment may be involved. Upper cervical chiropractic offers a long-lasting, low force correction that gives the tissue and nerves sufficient time to heal from damage. As a result, vertigo may become less severe or even resolve entirely.